Heather and Malcolm received their Letterpress Wedding Invitations just last week and I was so excited for them to get it! So, of course, it was only fitting for me to showcase it on the blog as well. Heather contacted me in January of this year for their June wedding. When she contacted me, she mentioned wanting a custom design that was classic and elegant. They’re getting married in New York so we were able to incorporate some New York design elements into their suite. The letterpress printing was done on our C&P on our Fluorescent White cardstock; 220# for the invitations and 110# for the additional pieces. Heather and Malcolm wanted a 1-color suite and wanted Teal as their main color. I was really excited to print with this color since I think it’s just absolutely beautiful! I mixed the ink myself and was very pleased with the overall print. The details in the skyline and even the symbols for the events came out beautifully. I really loved how letterpress felt! 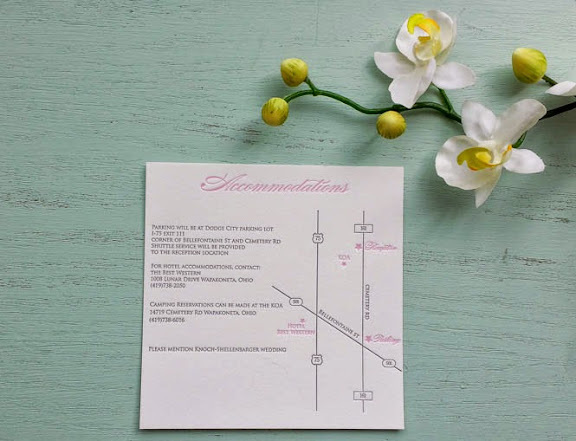 I pressed the Letterpress Invitations as deeply as I could; without compromising the cardstock, of course. This is part of why I love printing with the 220# cardstock. 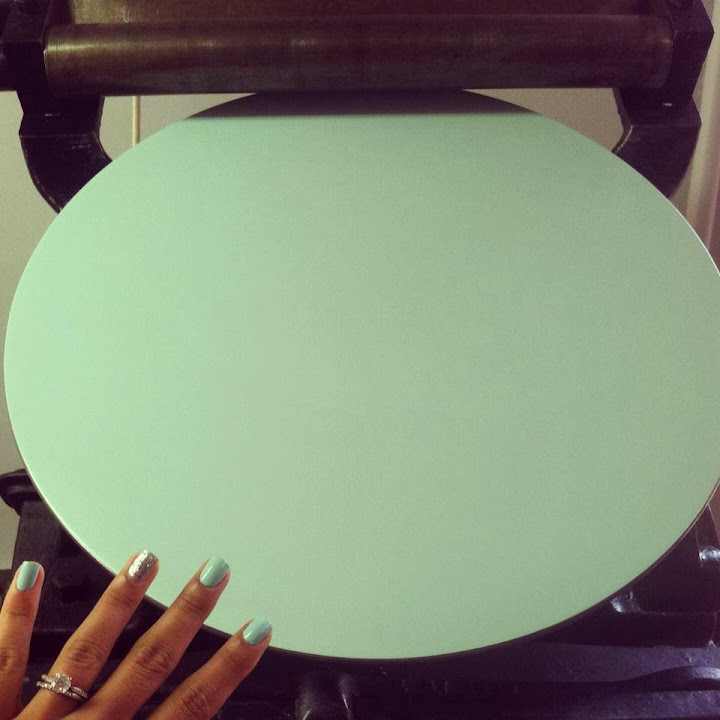 I love pressing it deep to really showcase the beauty of letterpress! 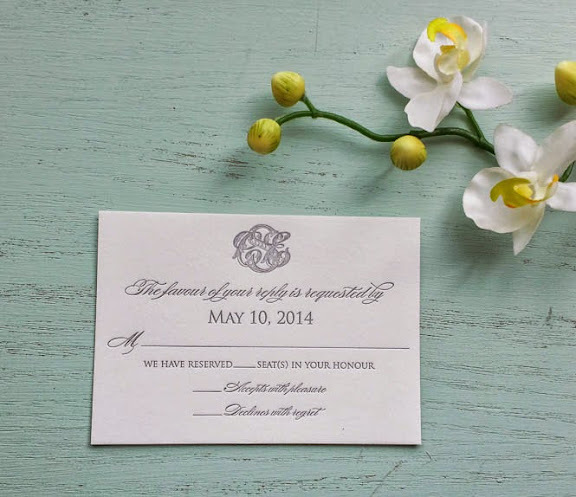 I was so excited for them to receive their Letterpress Wedding Invitations! Elma, they look AMAZING!! Thank you so much! All caps for “amazing.” That made me smile from ear to ear! As always, please be sure to check us out and like our Facebook page for most up-to-date news and more photos of our Letterpress Wedding Invitations! 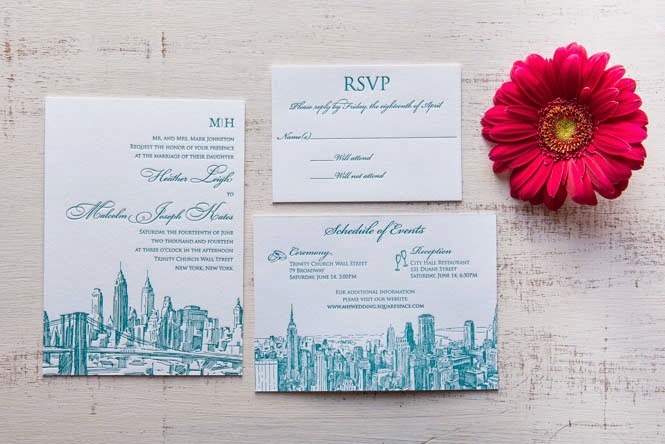 I had the absolute pleasure of working with Codi on her Letterpress Wedding Invitations. She literally just got them yesterday and I was so excited about them that I really wanted to showcase them on the blog today. Codi contacted me in October of last year and was interested in a custom letterpress design. She’s getting married in beautiful Hawaii this coming April and having a reception back at home in Ohio. We worked on incorporating some tropical type leaves to give it more of that “beachy, fun” vibe. We decided to do the leaves in a blind print and the text with our silver ink. The rest of the suite was in the silver ink with the exception of the Accommodations card which was pink (to match the edge paint) and silver. She also sent me this gorgeous custom monogram that I absolutely fell in love with. I was excited to see how it would come out in letterpress printing and I was just over the moon with the final product! So, without further ado, here they are! 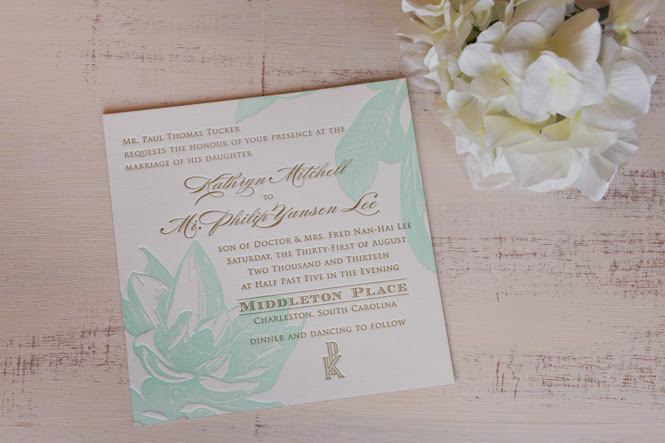 The letterpress printing was done on my favorite C&P with our beautiful Pearl White cardstock. The invitations were on the 220# and the accommodations and RSVP was printed on our 110#. I updated her along the way with how the letterpress printing was going and updated her as much I could regarding her letterpress wedding invitations. I sent her a few sneak peek because I really couldn’t contain my excitement over them and I just had to share! I e-mailed her yesterday to make sure they arrived safely and this is what she sent back. I love these types of e-mails as they truly make my day! I am so honored to have worked with someone so wonderful and was so happy to be a part of their wedding. Thank you, Codi! For fun updates and sneak peeks of other Letterpress Wedding Invitations, please be sure to visit out Facebook page and follow us on Twitter! So honored and pleased to announce we got the award for 2014 The Knot Best of Weddings! Thank you!!! 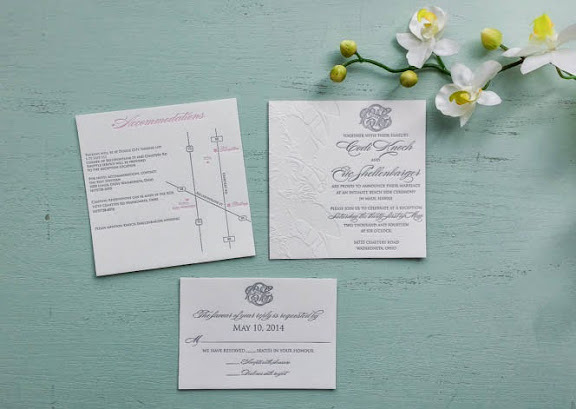 Ever wonder how to get started with us for your Letterpress Wedding Invitations? It’s very quite simple. 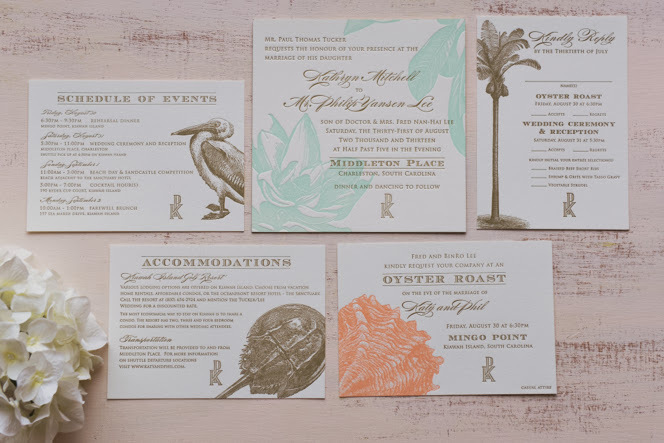 We’ve decided to put together a step-by step guide to showcase how easy it is to get the letterpress invitations of your dreams! We specialize in custom designs here and we hope we can work with you to create something special for you and your fiancé on your big day. How many invitations are you looking for? How many colors are you interested in? Will you be needing additional pieces (e.g. RSVP cards, envelopes, etc)? Once those are determined, we’d be more than happy to provide a quote for you! Step 2: Moving Forward – Once we finalize a quote that fits your specific needs, we do require a 30% non-refundable payment in order to get started with the designing phase. Once we receive the payment, we can begin the fun part; designing! 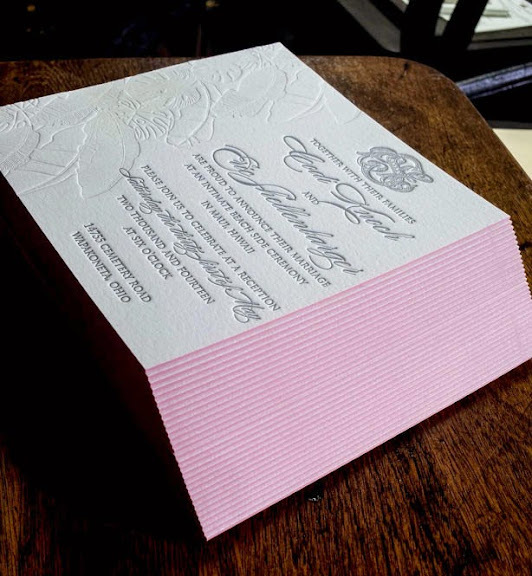 We usually like to ask if you have a preference on the wording used for your letterpress invitations, and if so, we’d ask for you to send them over. If not, we most definitely can assist with that! 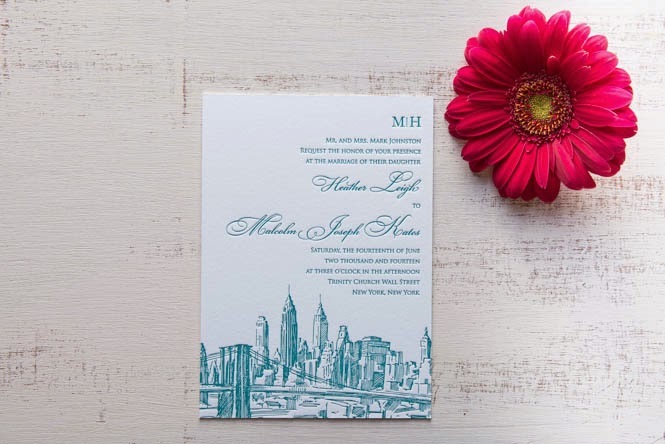 Along with the wording, we like to ask for any inspirational photos of invitations you like to get a better feel of the look you’re going for. From there, we’ll work on custom designs for you and will e-mail you the PDF proofs for you to review and approve. Once the designs are approved, we move onto the next step. Step 3: Platemaking – We’ll submit your approved custom designs into platemaking and once they’re received, we begin printing! Step 4: Printing – This is our favorite part! To see the design printed and come to life! 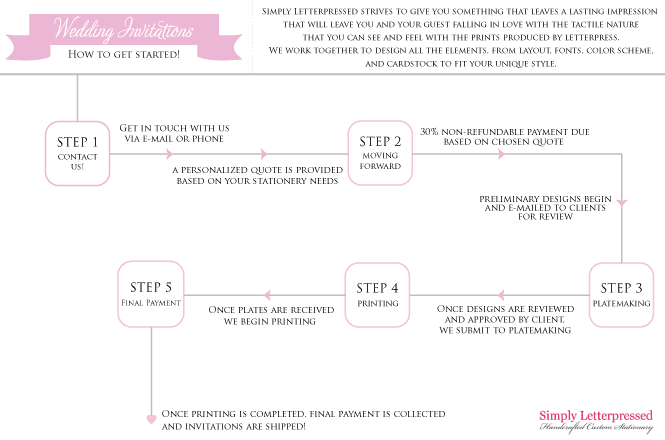 Step 5: Final Payment – Once we’re finished printing, we’ll contact you and arrange the final payment which is due before shipment. Once the final payment is collected, we will send you a confirmation e-mail along with a tracking number. We know planning a wedding can be somewhat stressful and we try our best to keep this part as enjoyable and stress-free as possible! Please feel free to check out our Facebook and Twitter for photos and updates. 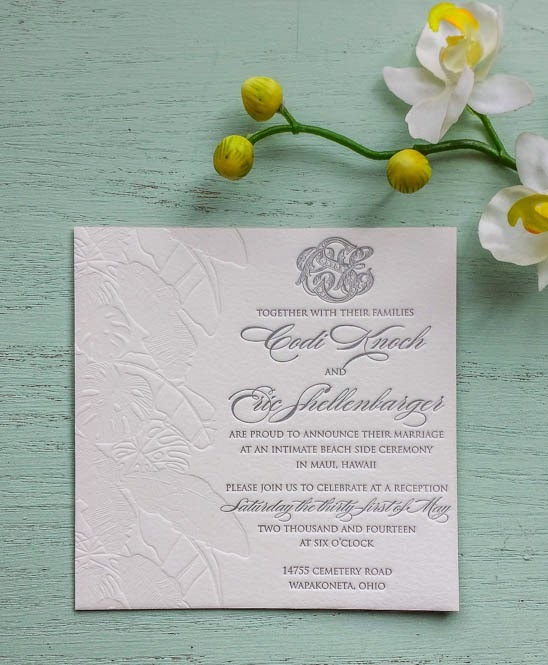 Please contact us today for your free quote for your Letterpress Wedding Invitations! Happy Monday, friends! I’m a little late on posting these Letterpress Wedding Invitations we printed for Katy and Phil back in August of 2013, but I love them too much not to share with you! I started working with this lovely couple in early February of 2013. They tied the knot at the beautiful Middleton Place in Charleston, South Carolina, and what a venue to get married at! 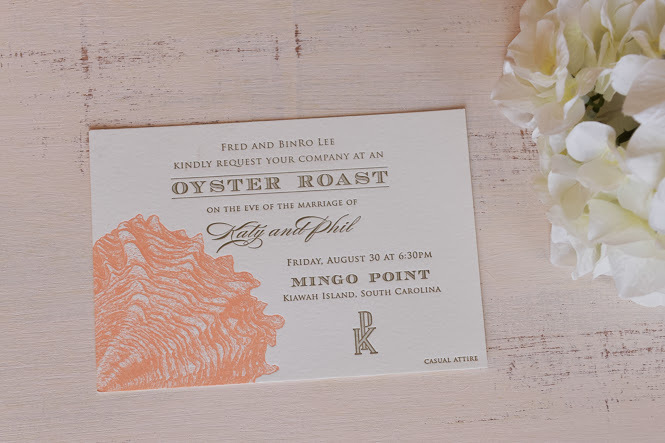 Katy and Phil wanted to go for a “Southern/French” feel for their letterpress invitations. They wanted to incorporate kind of an “etched” look of designs and a beautiful custom monogram that Phil himself worked on and submitted to us! 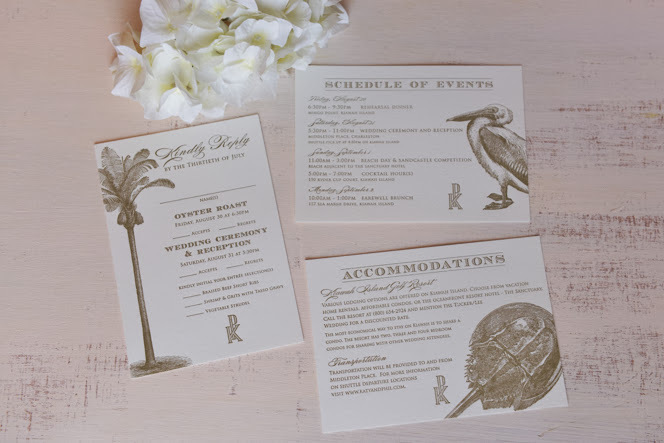 Their custom letterpress designs consisted of beautiful images, different ones on each piece, with my favorite fonts printed in our Gold ink. I really loved how the mint and coral colors came out as well. We also had the main invitations edge painted with the gold color and it all just tied together so nicely! I felt like the invitation suite was elegant, yet fun at the same time. I just absolutely loved printing these! Also, totally unplanned, but when I was printing the mint color, I happened to have on a mint polish on my nails that day that matched exactly to the mint ink. Working closely with Katy and Phil on their letterpress invitations, I really felt a part of their wedding. Does that sound weird? I just feel so connected to each person I work with that I just feel so unbelievably honored to have been included in such an event in their lives. Thank you, Katy and Phil, for being so fantastic to work with! My nail polish matched the ink! 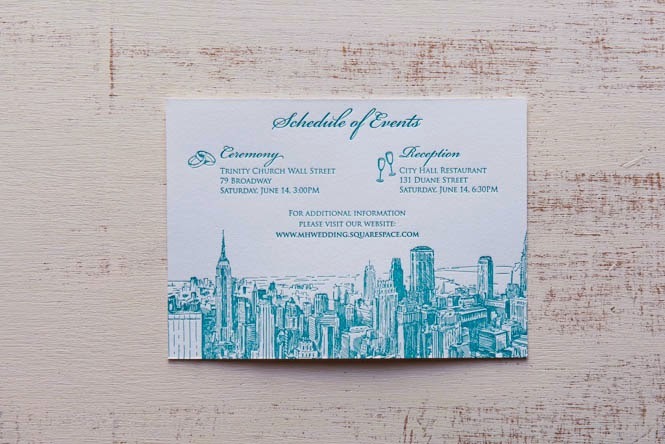 For more letterpress invitations and fun updates, please visit our Facebook page! Follow us on Twitter as well!